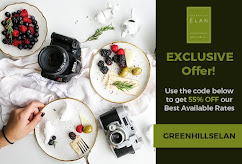 Hailed as Better Living's Best Kept Secret by Awesome Planet, Orange Whisk Restaurant and Patisserie isn't actually a secret anymore, well not to those who pass by the discreet road going to Sucat, Paranaque Municipal Hall and those that live around the area. In fact, they have been operating and serving up haute quality dishes for more than a year already. I'm prophesying that Better Living, Paranaque is the next foodie destination in the coming months, as more and more cafe's, community bakeshops and restaurants are opening. Dona Soledad is an avenue teeming with community-serving small scale restos and we had just recently discovered the place when we where out looking for a cozy place to have dinner that is a bit away from traffic and near to us. These are for times when driving to Maginhawa St., of QC or Kapitolyo, Pasig is a popular tumult. As an evidence, I have posted our first trip down this alley here. 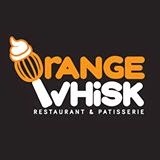 Orange Whisk however is located a few more drive from the main road of Better Living. From Dona Soledad, you need to look for France St., which is at your left if your coming from SSHway. You may want to take note of BDO on that corner. Down that street, there would be a bend on the road as you see an enclosure gate upfront. As soon as you turn left, which is the Michael Rua St., you will notice an orange and black signage, which is Orange Whisk's. Don't be intimidated by the quaintness of the venue, being on a residential zone, expect nothing much. Parking is a breeze though as ample spaces are available. The restaurant has undergone some developments already. The space being occupied by the cakes and pastry display area, with the commissary at the back, used to be a convenient store. So now, they have more rooms to move about and to cater to more diners. I was a bit afraid that the place will strike us with vivid orange paints all-over. Connoting from the restaurant's namesake. That's the psychology of the orange being a color, there is usually a strong positive or strong negative association – you either "love it" or "hate it.” But I ate my negative visual imagery. As we went inside (yes, I brought my husband and my girls with me this time), what surprised me was the sublime vibe the place elicits. It's artsy, yet comely and elegant. The walls and beamed ceiling are painted with white and the splash of oranges are unobtrusive. On the walls are huge paintings depicting the restaurant's theme. Gray, leathered seats and table covers are used, showing a bit of sophistication and practicality at the same time, as it is easier to wipe and clean; orange spray-painted whisks are at the window display area; cute black, silver and orange whisk-like lighting fixtures adorn the place. They serve wines to pair with their menu and often times they serve out dishes which are not on the menu. That's what the black board at the counter is for. Listed there the chef's special for the day, some dishes that aren't usually served on daily basis and other stuff that pop up on the chef's list. For he does the marketing and unusual market finds interests him to create out of the menu dishes. This is our youngest daughter trying to see if she can turn into a super hero with a magical orange whisk. After meandering around the main dining area, I followed my girls as they constantly call for my attention. For the biggest reason they loved to be in this resto-sweets! These were all crafted by Chef Korinne Lirio and her magical wands, este, whisk. The community love coming over for these baked goods and lovely specialty mini cakes. As you can see on the photos, they are priced very reasonably. What we would be coming back for more though are their signature Chewy Buns, only P 28. We sampled a few before we started chugging our lunch down. They are like pan de sal, but more airy and are made chewy, with a hint of coffee or brown sugar. Though trying to disguise as pan de sal, a bite will tell you other wise, there's that unique crunch on the outside and gets chewy as you masticate it. 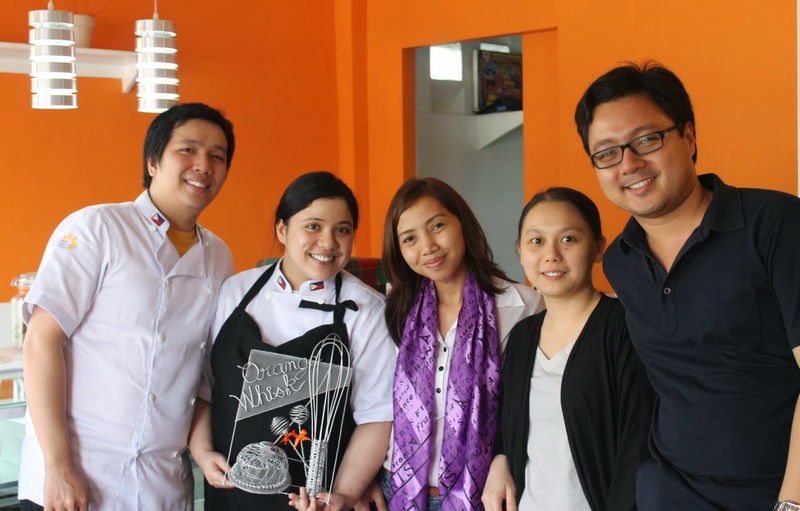 I came to know Orange Whisk through Chef Anna of My Pink Wasabi, she is the lady in black cardigan over a gray shirt, together with her boyfriend Raymond Quisumbing. Chef Anna procures some of the dessert offerings at the resto such as her renowned Kashi Makis. At the photo above, the couple on left - Chef Isaiah Ortega and Korinne Lirio are the power couple behind Orange Whisk. 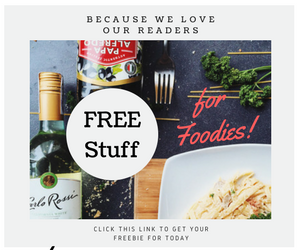 As I'm drafting this post, the couple was representing their restaurant at Philippine Culinary Cup and have brought home the bacon! Chef Seya, as many knows him, won 6 medals which is enough to say that he does cooking seriously. Of course, the best part you have been waiting for, sharing you now how the experience gave my family the cheer we needed after a grueling week of my girls' hard work to keep up with their PACEs and of course the storms. If you didn't know, this place is also a good hangout for your out-of-the-office works, Wi Fi is strong and reliable here, and the best part is you can have their affordable pastries and coffees to go with that. Chef Seya would broach that every meal starts and ends with Chewy Buns, I couldn't agree more. Now, prepare your tissues for a drool-inducing affair. Wait! Please promise that you won't curse, you won't send me hate messages, and not finishing to read the whole post. Everything here is made from scratch, the dressing and the croutons, while making sure that the ingredients are fresh. Expect the dressing to be a bit tangy from the mustard and garlicky, with a balance of saltiness from the sporadic paper thin parmesan slices, and anchovy bits. At a glance, and from my daughters' point of view, this would flake them out of the kid's universal dining standard. I mean, most of the kids I know don't eat squid tentacles, and my kids are not an exemption. However, and quite surprisingly, they tried to chew on not just one but a few. So, I guess they liked it, or were they just pretending to be adventurous, like their mom. I liked it as well and everyone agreed with me, when I said it was the most tender and savory squid tentacles I have tried. Don't get me wrong, I cook this at home but I just couldn't seem to get the texture right. It's all about the execution, I reckon. Adobong Pusit sa Gata, Bawang at Talong na Hapon. 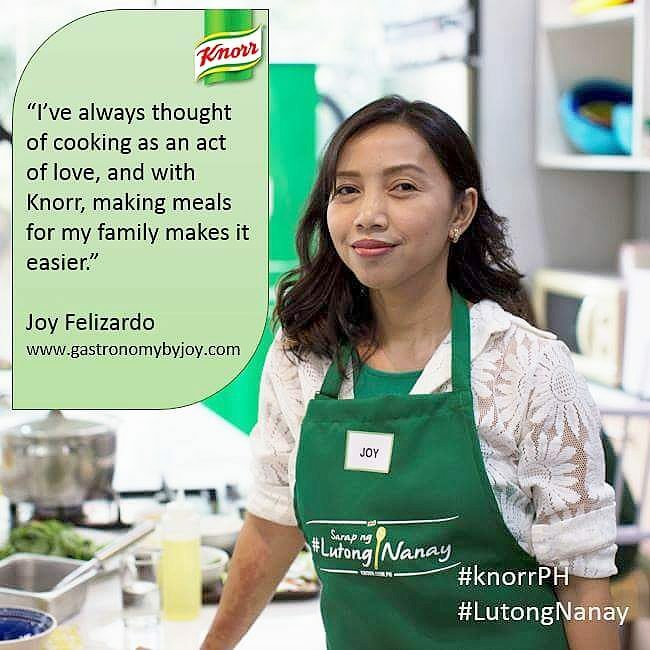 Chef Seya, btw is known for the best Adobo, the "Adobo Queen" (Nancy Lumen Reyes) herself would attest to that. 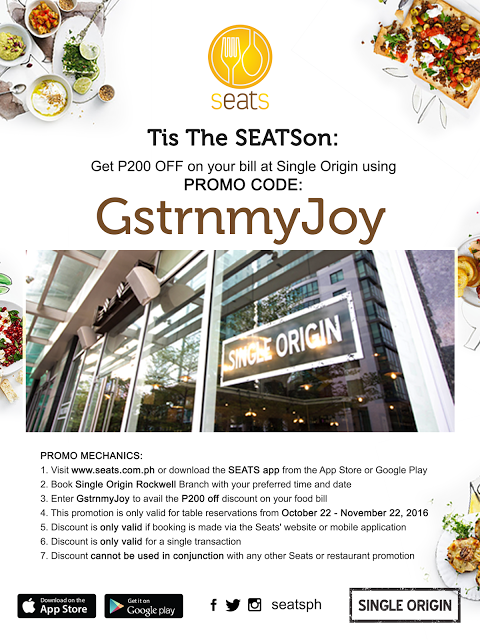 Adobo may come in myriad ways of preparation and this restaurant with a Filipino cuisine as the major fare, coming in seconds the pastas and then some elevated International dishes. The squid, an erstwhile over-looked gastro-delicacy, however humble in its origins won me over. The creamy soy-coconut milk mix is indescribable. Presentation-wise is superb. I've never seen grilled Japanese eggplants on Adobo, and how about those blue petals, don't they add a cunning touch to the dish. It's clitoria ternatea, also called as butterfly pea, said to be ayurvedic and not easy to find in the market. I'm just blessed I was able to buy a plant and it now flourishes in my garden together with other herbs and veggies. On this note, let me also say that some of the herbs used in the their dishes may come from their own plants. I think I still haven't mentioned my intimate love affair with Lengua Estofado, so far it's the only dish I could have ox tongue with, till now. Though, I need to mention that not all ox tongue dishes that I've tried have reached my standards. This one did, and with flying colors. Now, to the dis-heartening time of telling you how this have merited my favor (while salivating). First, the lengua (I don't like the sound of ox tongue) was braised for hours. When we say braising, it's the rudimentary process of searing the meat or browning it in fat, and then simmered in liquid on low heat in a covered pot. Then it was laid on a bed of buttery mashed potato and everything were slathered with blue cheese mushroom cream sauce. Then finished off with toasted garlic slices and thyme sprigs. What sets this to an avante-garde is the uniqueness of the dish. The steamed fish is heavily shrouded with what they termed as "tauso." Perhaps you are familiar with tausi - salted black beans. Tauso, on the other hand, uses white beans, which is boiled and mashed, seasoned and cooked with ground peanuts. I tell you this is what umami definitely tastes like. If there is something gourmet that can be bottled and sold, they are the blue-ginger sauce and tauso. I've surrendered on this one! I could never make a savory sauce as good as this, and gets even better when you get to have a bite of the Saikoro Steak which is Wagyu, making every tender and juicy bite like a slow-mo walk to a lavander field which leads to a calm lake surrounded by blooming flowers. Definitely a must-have when you get the chance to dine here. A friendly reminder: Do call ahead and ask if they have this on the daily menu, aside form it selling like hotcakes, they do change daily menus. Just so you know and that you don't get disappointed. Having garnered a few medals for the Sous Vide category for this year's culinary cup, this dish will really have you clapping and congratulating Chef Seya and the staff. Let us just hope they remain consistent in their serving and execution. Modernist kitchens are now gaining reputability through acquiring sous vide cooking machines. Sous vide is a culinary term where in ingredients are placed on boiling bags and cooked in a water bath on a controlled temperature. The thing about this style of cooking according to pros is that food are cooked evenly from edge to edge, to exactly the doneness you want from cooking steaks to perfectly poached eggs. I'm not a great fan of sous vide, however I'm a huge fan of kaffir limes. But judging from the whole package, this dish seem to resemble Hainanese chicken on a different level. The glazed chicken is served with ginger dipping and the dark caramel kaffir lime sauce. Another dish you can ask if they have (not on the regular menu) is their Thai curry based dishes. In this case I was able to try King Prawn with curry. I love how the curry harmonizes with the coconut milk (gata) making the slimey, creamy and spiced sauce delirously yummy. I was fascinated by the presence of lady fingers (okra) here. Being a Thai-inspired dish it also have basil and parsley. Before you take your final gasp, let me now introduce their version of Bagnet. Sinful and deadly! That's all I can say, once this is served you can't stay away from popping one after another. After a brief show and tell of part of their menu flare, it was Chef Korrine's and Anna's turn to overwhelm, with there decadent dessert platter. Everything on the dessert plate were heavenly, I loved it all except for the Caramel Mousse. It was too cloying. I do love how it was presented, however it would have been a killer dessert if the mousse was thicker in consistency not syrupy as what was served. Lastly, my daughter would love to thank Chef Korrine and Chef Anna for preparing a sugar-free dessert. It's a cold raw cacao mousse with choco nibs. Perfect way to end one glorified lunch. I don't normally use that term in this blog, but I'm letting these photos of my girls' Orange Whisk experience do the verdict otherwise. Let me also say that the King Prawn Curry and the Fish with Tauso are exceptional. Presentation-wise is admirable, each dish is picture-perfect. The staff are courteous and cheerful. However, note that this is a gourmet serving restaurant, so when the dish takes a while to be served, it means their are in a haste preparing every order from scratch, no thawed veggies, no microwaving, just fancy dishes priced a tad lower than gourmet food in high-end restos. Truth be told, there is nothing like the aroma of highly directional recondite ingredient, technique or dish to quicken the pulse of an insatiable foodie, fulsomely dedicated to breaking comfort zones. I can't help it, I have dedicated my self in the quest for exciting new taste experience and found one that's worth noting and that's not worth keeping as a secret. Address: 35 Michael Rua St., Betterliving Subd. I love the name and certainly love the interior design. The food definitely looks god! The main dishes as well as the side dishes look yummy. I remember nadaanan ko na ito going to Sun Valley. i love the color of the place the ambiance in the shop is indeed eye-catching, inviting and cool...i love the cookies they sale looks really good. I like the name. The restaurant looks very neat and clean. You make me drool with all the food you took especially the pusit, missed eating it so badly. The place looks so cozy and the foods simply glorious! I particularly like the food presentation; it sure is a winner like no other!I love how they made a contemporary setting out of orange. I find that rare!